Nuts are notorious for taking a long time to bear. For most species, you probably shouldn't expect a harvest for at least a decade, and during that time nut trees may spread to cover an area fifty feet in diameter. So it's no surprise that many homesteaders instead turn to the bush growth habit and relatively fast bearing nature of the hazel. Of course, "relatively fast" isn't exactly speedy. Almost five years after planting, our unnamed hybrid hazel variety from the Arbor Day Foundation is finally starting to take off, and I was excited to see both male and female flowers on the bush this spring. I'd thought the latter dropped off, but closer inspection this week turned up a few developing fruits nearly hidden amid the foliage. Since only one of the three bushes I originally planted survived, this bush is either self-pollinated or (more likely) the wild hazels about a hundred feet away in the woods provided enough pollen for everybody. 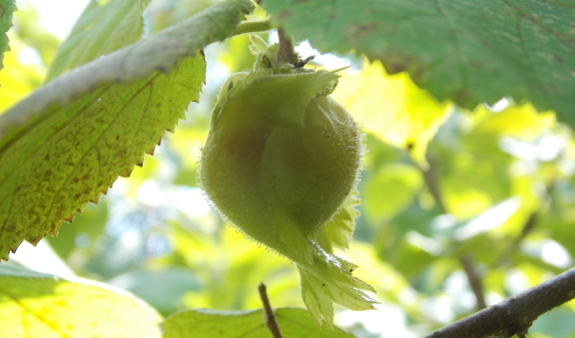 No matter who the nuts' daddy is, I'm excited to think that we'll get to taste our first homegrown hazels this year after all! 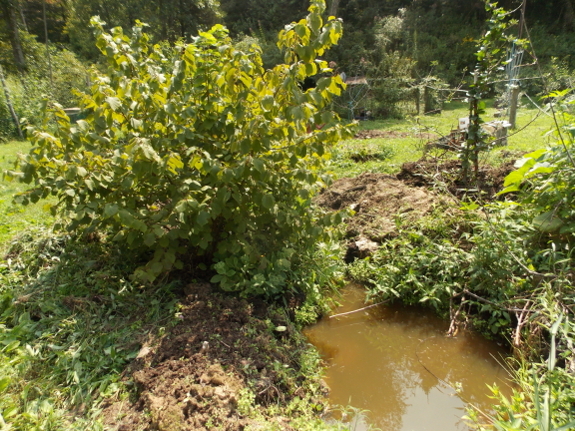 Despite our bush's slow initial growth, it has proven itself able to handle waterlogged soil, as is evidenced by the "pond" in the photo above, which is actually a pit I dug to gauge groundwater levels and to elevate the surrounding soil. Unfortunately, the two named varieties I planted in the starplate pasture this spring have been less resilient in the face of heavy deer pressure. Only one of the two bushes has survived and I recently decided that the hazel would probably do better if transplanted into the safety of our core homestead close to its cousin. In fact, I might even dig the little survivor up now rather than waiting for the usual transplanting season (after the leaves fall) since I'm not sure how much plant will be left after a few more months of deer grazing. Rambling aside, the purpose of this post is really to tell my father to go check on his hazel bush. Yes, you think it's never born fruit, but I had to look really, really close to see the developing nuts on my bush, so yours might have them as well. Or you can wait a few more weeks until the husks turn brown and look less like leaves, at which point I suspect the nuts will be more evident. I always know that I have nuts and that they are ready when the squirrel s turn up.They are always really difficult to find but worth the effort.I cottage for walnuts and chestnuts, both are ready about the same time as the hazelnsuts.